"This year's our sixtieth anniversary season, and that's terrific because we really get to celebrate all of the wonderful people and organizations and donors and volunteers that have all come together over the last sixty years to make us really Austin's favorite summer musical," says Zilker Theater Productions' artistic director, J. Robert Moore. Moore is new to the job of artistic director, but he's not exactly new to the Zilker summer musical. He's been a patron for many years and directed last year's show, The Wizard of Oz. Joining the Zilker Theater Productions staff is a sort of homecoming for Moore -- he went to college down the road at Texas State and has been hoping to return to Texas for some time. "All throughout my career, I've always wanted to come back to the south central Texas area and put on the types of big shows that I became accustomed to being a part of and working on all over the country -- in New York and at regional theaters -- so I was very excited when this terrific opportunity came up at exactly the right time," he says. ZTP's executive director, Kate Hix, started as a volunteer (selling concessions) in 2009, and after serving on the board for a few years, became the organization's first paid executive director. "What people don't know, probably, is that even though we have about a hundred people behind the scenes and a hundred people in front of house and on the board and making everything happen, the vast, vast majority of those people were volunteers before 2013," Hix says. In the past few years, ZTP has moved to hire a larger paid staff, but it still relies heavily on volunteer work to stage a lavish (and free) musical in the park every summer. Since this summer marks the sixtieth anniversary of the summer musical, Zilker decided to stage a play that's set in roughly the same time period that the first Zilker musical was staged. They picked All Shook Up, which is set in the late '50s and takes its inspiration in equal parts from Elvis Presley and William Shakespeare (it's loosely based on Twelfth Night and features twenty-five reimagined Elvis songs). "It's this kind of great summer farce that we're doing out on the hillside in the middle of the night air and with the cicadas singing, so it's a really great venue," says Moore. In her first year in the Zilker musical, Heather Capello is playing Natalie (who's based on Twelfth Night's Viola). Like Moore and Hix, she was a fan of the summer musical before being hired on. "I've seen many shows here, so I'm having a good time. I feel really well taken care of," she says. "It's a great time." And like Moore, (who was her classmate at Texas State), she spent some time travelling and working around the country before coming home to Texas. "My family is here. I went off and I had my wanderlust years and that was a really great time, but I think I always wanted to be back here too." 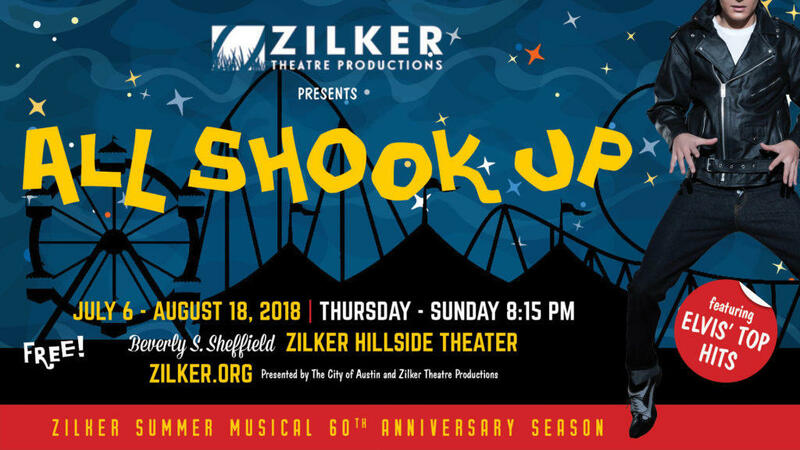 'All Shook Up,' the Zilker summer musical, is free to the public at the Zilker Hillside Theater through August 18. 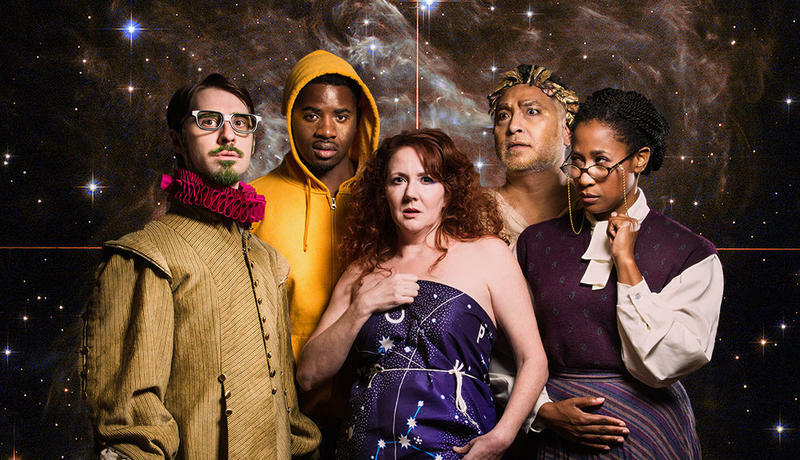 "Reina has this uncanny ability to mash together hard science and the most fantastical myths that you’ve ever heard of," says director Liz Fisher of Reina Hardy, the writer of the new play The Afterparty. "That seems like a really unlikely pairing, and yet through the sort of beautiful alchemy that only she can do, she creates these stories that are beautifully human and... universal in their themes -- these ideas of love, of loss, of moving on, of hope, with a whole lot of magic."